Twins—twice the work and twice the blessing! As a mom of three, I give so much credit to anyone who has to go through a twin pregnancy and then raise two infants/toddlers/teenagers at the same time! When I think about twins, I take one look at any one of my kiddos and imagine two of them at one time. Then I panic. Leave it to one of my dear friends to make life with twins look easy. 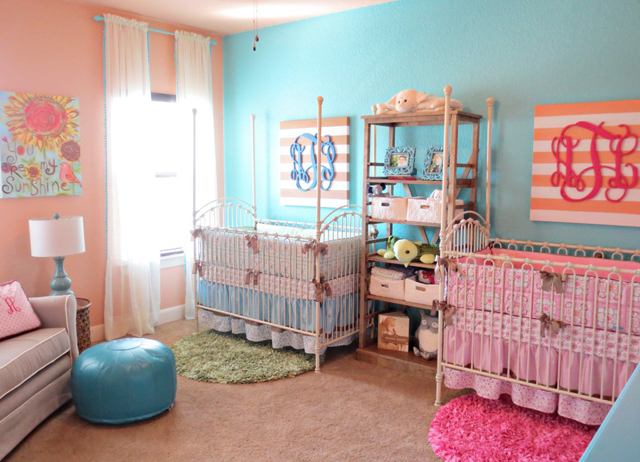 I helped her design her babies’ nursery, and when it looks this cute, how could you not want twins? This is one of my favorite nurseries I’ve worked on recently. I never shy away from color, and I love how this coral and aqua twin nursery features my two favorite colors in nursery design for 2014. Our design inspiration started with the bedding. The mommy wanted bedding that coordinated but wasn’t exactly the same. I love how the two crib bedding sets are identical in print and style but the colors vary from boy to girl. It gave us the opportunity to separate the crib wall and make it look like the room has both a boy side and a girl side. The tall bookcase (bolted to the wall, of course!) between the cribs offers storage and display opportunities, and it will keep reaching arms at a distance once the babies are old enough to stand up in their cribs. I knew I wanted to add a bright decor feature above each crib, and with so much going on in the room, it had to be bold and beautiful. You can check out my DIY post on the monogram wall art for detailed instructions, but basically I painted stripes on a blank canvas and used hot glue to attach the monogram! I love the three-dimensional effect of the wood monogram on the canvas, and the color combinations give the artwork that extra boy/girl distinction. The curtains in the room are one of my favorite DIY budget tricks! They are a long 108″ white sheers from a big box store, and we attached turquoise pom-pom trim to the sides to give them a custom look. Notice how the curtain rod (spray-painted turquoise to match) is pushed all the way to the top of the wall—this is a great way to add height to the room and give it a dramatic feel. The oversized glider is perfectly accented with matching his and hers monogrammed pillows, and the eclectic combination of the wood side table and leather ottoman pouf bring the design together seamlessly. Andrew and Anastacia are two lucky little kiddos—not only do they have a rockin’ mom (who balances twin life better than I could ever hope to), but they’ve also got a gorgeous coral and aqua twin nursery that will hopefully be the background for many sleep-filled nights and fun-filled days. Where did you find the oversized glider? I’m expecting twins and I love it for tandem nursing! Did you ever figure out which brand, etc. the chair is? I’m hoping for the same thing you are! !